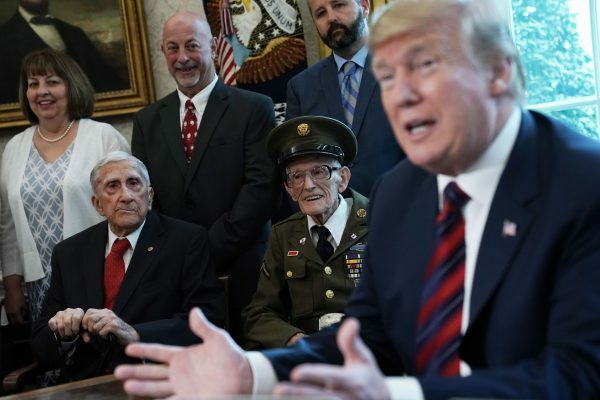 President Donald Trump hosted four World War II veterans at the White House on Thursday, keeping a promise made to 95-year-old Allen Jones last June. “Beautiful afternoon in the Oval Office today with a few great American HEROES!” Trump tweeted Thursday afternoon, along with a video showing his June conversation with Jones. 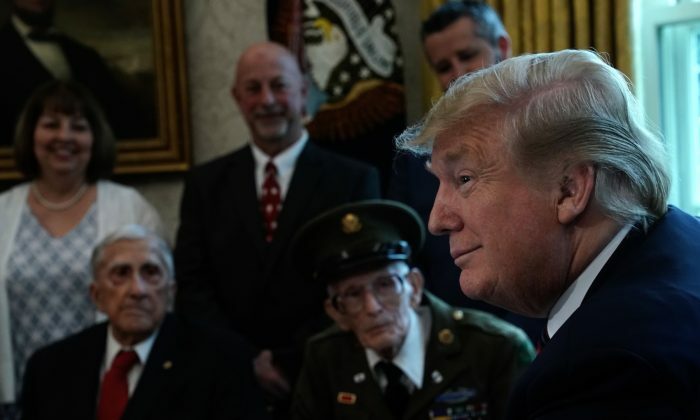 Fast forward to Thursday, April 11, and Jones joined centenarians Floyd Wigfield, Sidney Walton and Paul Kriner inside the Oval Office for a visit with Trump. Wigfield even reportedly won a promise from Trump for a ride aboard Air Force One back to the United States after June’s annual D-Day ceremony. The @WhiteHouse media pool summoned to the Oval Office for what had been scheduled as a closed meeting between @POTUS and several centenarian WW2 veterans.